If you are running your site on Umbraco Cloud - and why wouldn't you be? - then source control is very much part of the experience, have a look at the 'Technical overview of an Umbraco Cloud Environment' and the information on 'Working with your Umbraco Cloud project' for a steer on Source/Version Control good practices. If you are hosting your Umbraco implementation outside of 'Umbraco Cloud', then it's generally considered 'good practice' to setup source/version control for your site implementation files, particularly if you are working with a team, to track changes and manage conflicts with other developer's work. What folders and files should I exclude from my source control repository? So this documentation can't be an exhaustive list of how to version control Umbraco in all possible scenarios, but hopefully will give you an insight into the anatomy of how an Umbraco website hangs together and therefore which parts to include in version control and which parts not to. 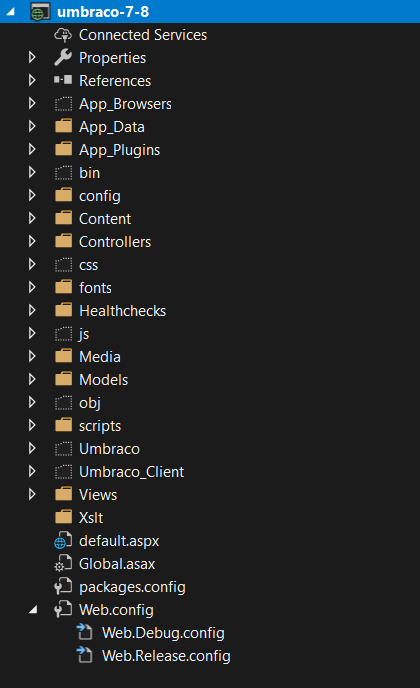 These are the /umbraco and /umbraco_client folders inside your Umbraco project. These should not need to be source controlled. Their contents change when you upgrade Umbraco, but no part of your implementation or third party packages installed should update these folders. Historically that has not always been the case, and in the past icons and plugins have been added within these folders, and they have needed to be added to source/version control. Generally if you are working with Visual Studio and a Build Server, it's Nuget's job to restore the correct versions of these folders for you and generally you wouldn't include these folders in your Visual Studio project, there is a build step, that ensures they are 'deployed' along with your solution when using Web Deploy. and the published cache file amongst others. Unless configured otherwise, these will generally be created in the App_Data folder of your application, and do not need to be source controlled. Logs - Umbraco currently uses Log4Net, and a file will be generated in this folder containing tracelogs of your application, one file for each day. NuGetBackup - If you've installed or upgraded Umbraco via NuGet, then a backup of files before they were replaced will be copied here. Temp - as the name suggests, temporary no need to source control. ClientDependency, Umbraco uses the Client Dependency Framework, to minimise and amalgamate css/js resources into single requests for use in the Umbraco backoffice - a cache of the processed resources are maintained in this folder. ExamineIndexes, Umbraco uses Examine (a provider based Indexer/Searcher API that wraps the Lucene.Net indexing/searching engine) to index content and members for the Umbraco backoffice search, unless configured otherwise the indexes will be generated in this folder. PluginCache - a hash and list of the plugins installed in your implementation, for detection of changes at startup. umbraco.config - This is an XML file containing all published content on your site - Umbraco will continually update this file, and a version held in memory when content is published and unpublished, so source controlling this file would play havoc with how Umbraco works! Umbraco.sdf - If you are using SQLCE for the data store in your Umbraco site, then this file IS that datastore, it will be difficult to source control the constant changes to this file. The strategy here will depend a little on which mode 'Umbraco Models Builder' you have opted to work with. Pure Live (default), The models are generated in memory, no source control required. App_Data, The models are generated in the app_data folder of your project (or can be configured to be in a different folder or project), allowing you to track changes to the models in source/version control. Dll, The models are generated into a class library dll, avoid adding the dll to source control, to avoid tricky merge conflicts! There is a custom Visual Studio Extension: Umbraco ModelsBuilder Custom Tool that you can install (along with the Umbraco.ModelsBuilder.Api NuGet package) to help generate models from within Visual Studio. The Media section of Umbraco (unless configured otherwise) stores files in the /media folder, these can be updated by editors, in the Umbraco backoffice, so generally speaking you would not source control these files. The App_Plugins folder is the home for all third party packages installed on your site Depending on how you installed the plugin - Nuget vs The Backoffice, how you deploy your site to your production environment, and whether the plugin requires site specific configuration... will affect how you choose to version control a particular third party plugin. Nuget + Buildserver - if the plugin is installed via NuGet then as long as the packages.config file in the root of your project is source controlled, then the installed files for individual plugins shouldn't need to be source controlled (and your deployment process should pull the packages implementation files from Nuget during the build and deployment process). Nuget + Manual deploy - here you don't necessarily need to source control the files, but you do need to remember to deploy them. Backoffice + Buildserver - you'll need to include the plugin files in source control as the build server won't know to restore them - if the plugin/package doesn't come with a NuGet resource, consider setting up your own local NuGet repository for your build server to pull the files from. Each plugin could be different depending on its implementation and functionality, it may contain files that it would be useful to track via Source control, and also files that should be ignored: check with the plugin's supporting website/developer for more information. What folders and files should I include in my source control repository? Umbraco site templates/views can be edited via the Umbraco Backoffice, but ultimately they reside in the /views folder on disk (or /masterpages on webforms implementations), because these views/template often include code, it can make an awful lot of sense to have their changes tracked under source/version control. However this can pose a problem if the templates are updated via the backoffice outside of source control on the production environment. Umbraco Cloud is a good solution in these scenarios, as changes via the backoffice are tracked in a Git repository automatically. ...all should be added to source/version control. 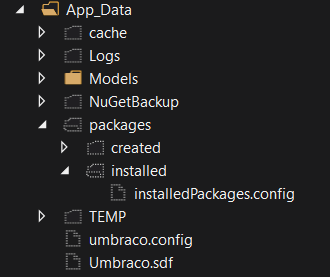 Your site's /config folder contains the set of configuration files for your Umbraco site. Add these to source control along with config.transforms to change variables for different environments during deployment. When you create and edit DocumentTypes, MediaTypes, DataTypes, Macros, DictionaryItems, Languages, MemberTypes & Templates('names' not the actual files) in the Umbraco Backoffice these values are stored in the Umbraco Database, making them very difficult to source control in a 'file based' version control system. uSync - which can be configured to serialize these changes to files on disk, in a folder called /uSync - enabling you to source/version control these changes too and synchronise them to other environments. uSync Snapshots - an extension to uSync, for taking 'before' and 'after' snapshots of an Umbraco site, for managing a release of a 'set of changes' between environments. Chauffeur, is another package worth investigating, allowing the issuing of command line deliverables against an Umbraco install. If you are working with Git, you can add a gitignore file to specify intentionally untracked files that Git should ignore. GitHub has a repository of gitignore files which are a great starting point for working with Umbraco and source control.